Naomi #3 review: Secrets – AiPT! Dee’s past! Naomi’s parents! Who is Naomi? Something’s up in Port Oswego, and Naomi is determined to find out. An adopted kid and the only person of color in her small town, her life changes after Superman’s very brief arrival in Oswego. She discovers that the day she was adopted was also the day a superhero arrived in the town. Confronting the local mechanic, Dee, she seeks answers. But what she gets isn’t what she hoped for. 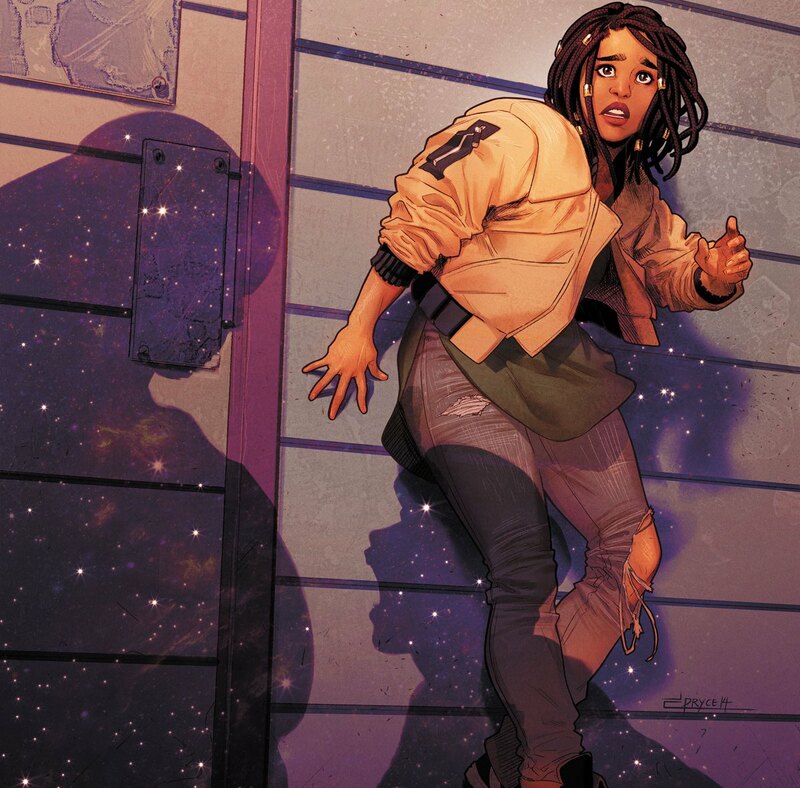 Jamal Campbell, David F Walker, Brian Michael Bendis and Wes Abbot have carefully built up Naomi and her work thus far, taking their time to lay out a slow moving mystery book. Naomi’s voice feels honest and she feels like a believable young heroine of modern times. But it’s really Campbell, more than anyone, who shines with Naomi and is the star of Naomi, who helps make her who she is. Boasting tremendous range of expression and a firm grasp of body language, he swiftly moves through a gamut of emotions and little nuances, giving its characters a great deal of humanity. They feel like real people you could come across and from every little pause and silent panel to a series of reaction moments, Campbell can move through shock, fear, anger, hatred, shame, guilt, doubt, exasperation and so much more in the space he’s offered. The ability to pack all of that in, to make the characters perform to the precise emotional specificity the story requires, that’s Campbell’s asset and it’s at the root of Naomi. Even the usage of colors and specifically the lighting are key elements Campbell excels in, casting things in grave shadows or dark blues and utilizing light sources and general gold in meaningful ways to draw attention to key details or moments. Or perhaps even draw attention away and in doing so, have the reader hone in. What’s cast in shadow often indicates a lot, from Dee’s eyes which hide and indicate mystery initially, to the moment where we focus in on them and in their light, have the truth be revealed. Little bits like that are what make Naomi such a delight to read. With the entire issue built on conversations, Bendis and Walker’s strengths are allowed to shine here through dialogue. Letterer Wes Abbott takes the spotlight, as he has with a lot of the book and maneuvers the audience through the story, maximizing the impact of every punchline or reaction. The smaller-case font choice works to great effect here, as when a full on uppercase line is lettered, the impact is even greater. The emphasis is even more huge, as proven by a key moment where in Naomi’s mother arrives. Although the previous issue promises the biggest secret in the DC Universe, #3 doesn’t quite deliver that. Dee’s tale has implied ties to whatever it is that’s at the heart of the entire story, but it’s not the story. Effectively acting as a red herring here and one with some degree of purpose, we’re given a tragic context that is equally heartbreaking for Naomi and Dee. He’s clearly a man in pain, who’s struggling and masks his tragedy. Meanwhile, Naomi, who assumed the woman in his photo was her mother, is let down and ashamed for her misconception, especially since what Dee has to recount only brings him greater sadness. It’s a poignant moment for the two characters and it also serves to build up Naomi’s world, establishing Dee as a tie to greater universe mythology. And then the parents arrive. This is where things get even more fun, as we get to see Naomi and her parents’ interactions beyond any and all pretension. Her mother is enraged at Dee and both of them glare at him with seething hatred. She speaks of a deal they held and escorts Naomi away, with the family driving off to a nearby cave. Naomi is to be shown the truth that she seeks and her parents promise her that they haven’t been lying to her all this time. Bendis, Walker and Campbell pull out some utterly delightful father-daughter moments here, going from fear and anxiousness to trust and acceptance and finally to awe. Turns out, Naomi’s father came to earth in a space-ship. And that’s just the start of things, as we get what is a sequence that operates off and evokes iconic Superman imagery but subverts it with some fun twists and plays on the conceit. The team is clearly enjoying the ride here and although it’s slow and decompressed, it’s very much the intent. Naomi #3 is a solid issue of a book that continues to be the most visually exciting and enriching experience DC comics has to offer this side of The Green Lantern. We’ve entered the cave and within lies the answers we seek. There’s no turning back now. The secret’s gonna break loose. Get ready.